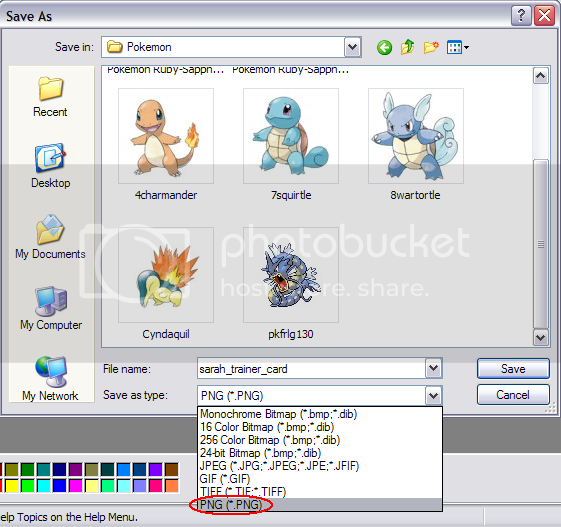 This Tutorial was made by Sarah (special_dude55) for Pokemon fans everywhere. 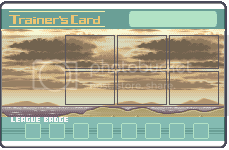 Anyone may use the tutorial to make their own card, but please do not copy and paste the tutorial or any part of it anywhere else without my permission. This tutorial is made for MS Paint/Paint. If you have any questions please neomail special_dude55. 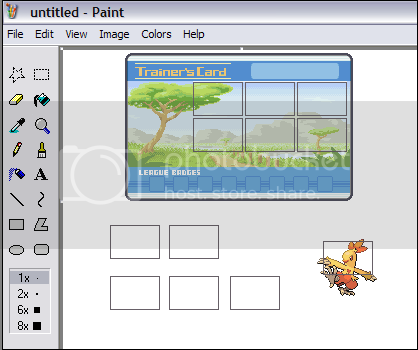 The only other place this tutorial is to be displayed is at the TPC website. The first thing you need to do is to find a template. There are lots of different templates, but for now, just click here and choose one. 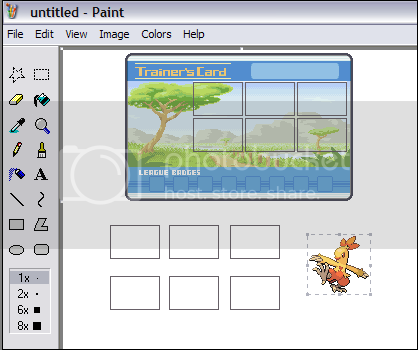 For this tutorial, we will use this template. Now, we need to right-click the template and click copy. Now open up Paint, or MS Paint. This will get rid of the white outline around the image. 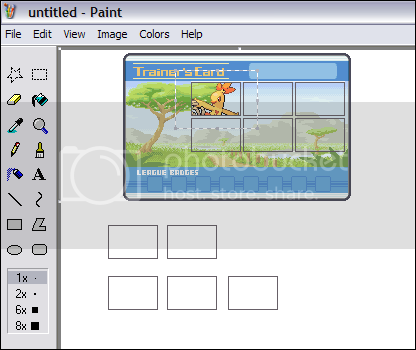 Now press Ctrl†V or go to Edit then click Paste on the top toolbar to paste your template. NOTE: If at any time during this tutorial, the sprites you copy & paste end up with a black background, it is probably because of the browser you are using. 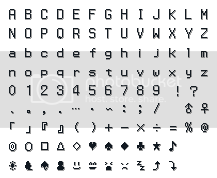 Try using Internet Explorer, or save the sprite to your computer instead of directly copying and pasting it from PE2K. 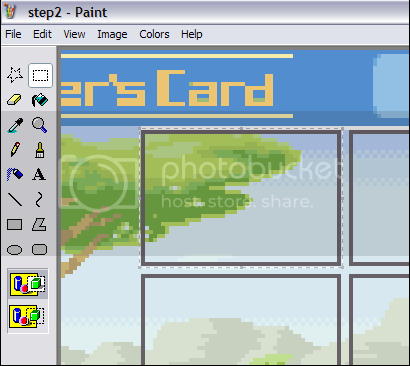 Now, you may want to zoom-in for this, so select the zoom-in tool and click your template. Now that we're zoomed in, it's time to add our Pokemon. 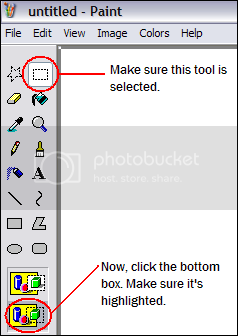 Select one of the squares (making sure you select the border too) and copy it (use Ctrl†C or Edit then Copy on the toolbar). Now, paste the square below the template. 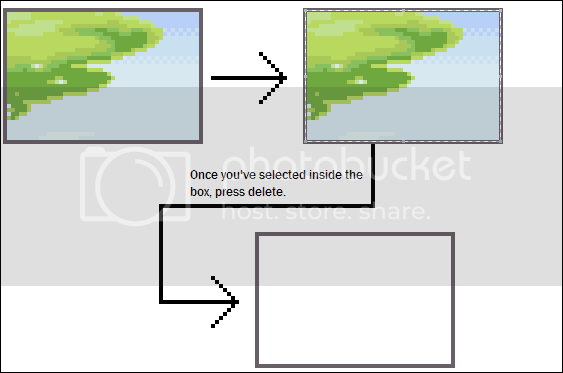 Select the inside of the square (not the border) and press delete. 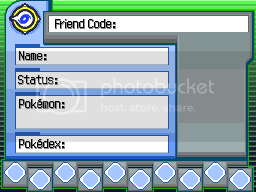 You should now have a white space where the Pokemon will go. Now, copy and paste the white box five times, so that we have one for each of the six Pokemon. Now, choose your six Pokemon sprites. 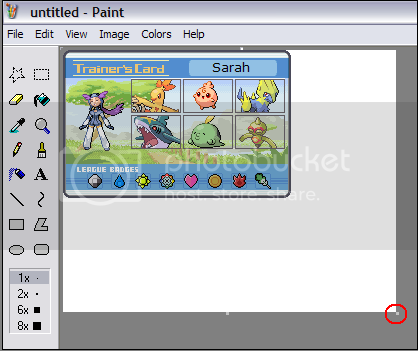 Click here for the links to Pokemon sprites. Right click the sprite you want, copy it, and then paste it onto Paint/MS Paint. Now, grab one of the boxes and move it over the Pokemon. Now, delete everything outside the box. 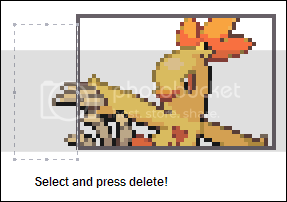 Now, select the Pokemon in the box and put it back onto the template. Make sure you line it up correctly. Now, repeat those steps for the other five Pokemon! This is one of the easier steps. 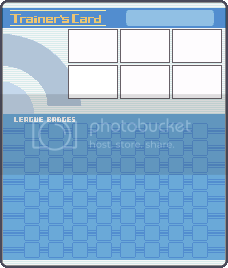 All you do is copy one of the following badge sets. Now, paste the badge set onto MS Paint/Paint. 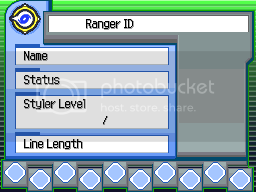 Select it, and place it on top of the area where the badges go. Try to line it up correctly. 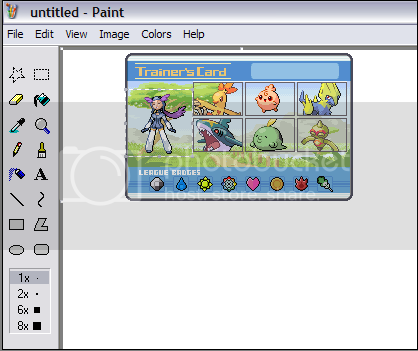 Click here for links to trainer sprites. Choose the trainer you want and copy and paste it straight onto the template, like so. Click the "A" tool to add text. Click where you want the text to go. You can choose whatever type of font you like, but I like to use Verdana, size 10. 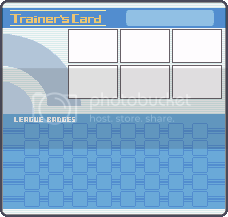 Now that your trainer card is finished, you can move it to the corner of the page. 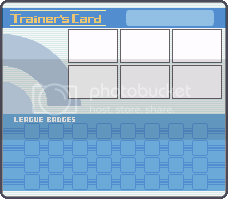 To get the best quality image, you should save your trainer card as a .PNG (highlighted here in red). 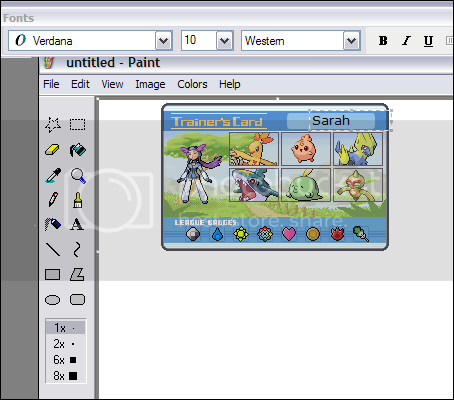 NOTE: .PNG images do not seem to be working for some people on Neopets for some reason. 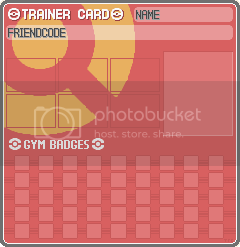 If your card comes out tiny, or doesn't show up at all when you put it on your userlookup/petpage and you know that you have the correct URL/code you may need to save the card as a .JPG or .GIF instead. 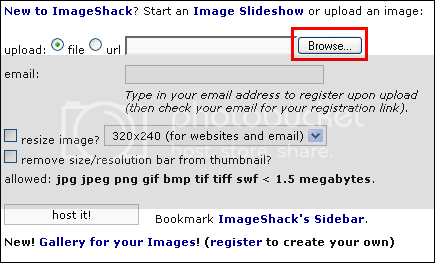 First, go to http://www.imageshack.us Then click Browse (highlighted in red below). 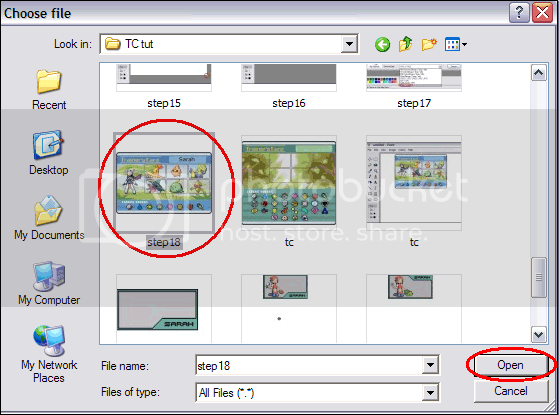 Now, select the Trainer Card file that you want to upload, and then click Open. 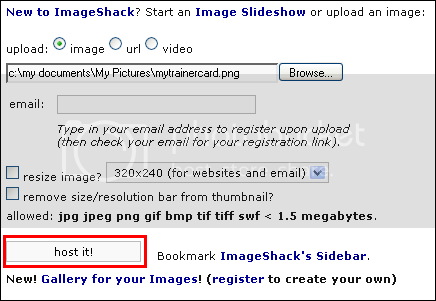 Now, copy the code in the box that says Direct link to image (highlighted above). This is the URL of your image. To add your trainer card to your userlookup, shop or petpage, you must use this HTML code. 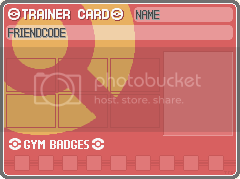 Once you have uploaded your image and are given the URL, you just place it in the middle of the image code, and then paste the code where you want your Trainer Card to show up. If you have any questions, please neomail special_dude55. If you are having trouble putting the card on your lookup, neomail the link/URL to special_dude55. You might have to put spaces in between so it will go through. I will neomail you back the correct code. 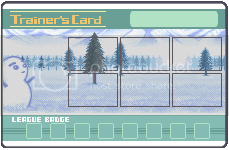 This is where you can choose a template for your card. You'll also need to separate and paste on the badges you choose individually. There are many places to get Pokemon Sprites, but these are some of the best. 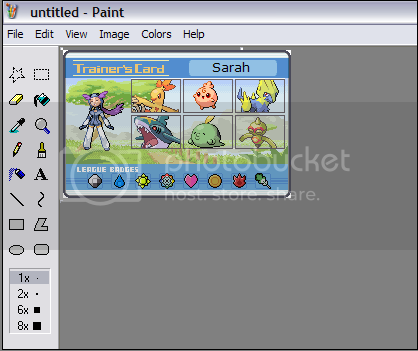 There are many places to get Trainer Sprites, but these are some of the best. Did you enjoy the tutorial? 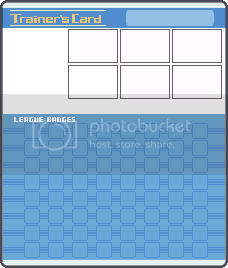 Wanna help others make their own Trainer Cards? Simply place one of these links on your userlookup, guild or petpage! The legendary Mew appears. Follow it to The Pokemon Center.